A hundred thousand Thais have registered to vote from overseas in the March 24 election, led by those residing in Sydney, according to the Foreign Ministry. Registration for overseas voting online and at 94 Thai embassies, consulates and trade and economic offices worldwide took place from Jan 28 to Tuesday. A total of 119,184 Thais registered to vote, led by those in Sydney (10,256), London (7,926) Tokyo (6,048), Canberra (5,927), Los Angeles (5,668), Singapore (4,763), Kuala Lumpur (4,139) and Washington (4,122). At left, Thais in Malaysia use cardboard boxes to vote Saturday in Kuala Lumpur. Photo: Muhammad Sasu / Facebook. At right, long lines outside the embassy on the same day. Two weeks before polls open at home, #OverseasVoting was trending atop Thai Twitter on Monday with many comments slamming the Election Commission and diplomatic missions for mismanaging early voting. “Student body elections at school look more organized than this election,” Twitter user @Litentoyou wrote. Criticism blew up after a student in China tweeted Saturday about the obstacles to voting, including a ballot that didn’t come until nearly a week after voting began. The student said more than 500 voters registered to vote in Shanghai hadn’t received them at all. “This election is the most transparent ever,” @TheKopfer wrote, sarcastically. The Foreign Affairs Ministry said the problems reported in China were due to missing voter contact information, adding that all but five voters in Shanghai had received their ballots by Sunday. Dissatisfaction over widespread reported mishaps fed existing concerns about the commission’s ability to stage a credible election at home in just two weeks. It comes days after it invited scorn by canceling important meetings because six members were traveling abroad at a cost of about 12 million baht. Muangphum Hansiriphet, who heads a Thai student association in Nanjing, called onlinefor an investigation into problems there. He said that while helping the consulate locate voters, he learned information entered by voters in online registration forms had gone missing or become unreadable when the commission submitted it to the diplomatic mission. 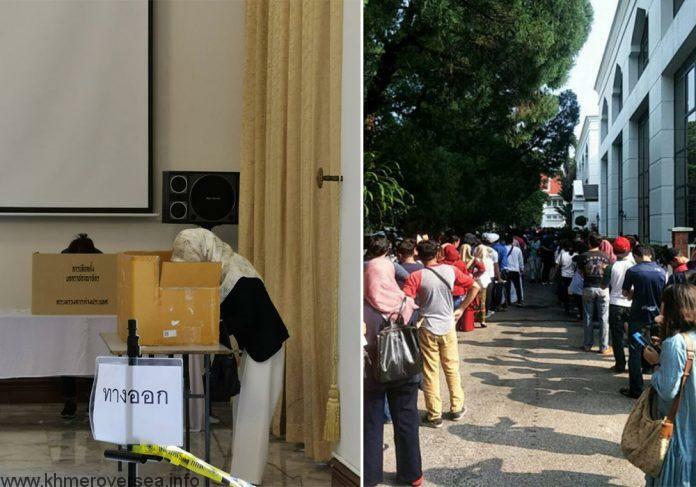 The Thai Embassy in Kuala Lumpur was forced to open Sunday for additional votingbecause it couldn’t accommodate the thousands who turned up the prior day. Many voters complained of waiting for hours and questioned why the commission couldn’t do better despite knowing how many people would vote. Officials were shown using cardboard boxes to set up makeshift voting booths in photos posted online, reportedly because they didn’t receive enough from the commission, further stoking public outrage. He also said the commission was looking into several complaints regarding confusing documents listing candidates and their numbers for voters in London and New York. Photos of the documents show some of the candidates names and photos did not appear next to their party names. For example, Parit “Itim” Wacharasindhu, who heads the Democrat Party’s youth wing, did not appear next to his party’s name. Instead it appeared above a candidate for the pro-establishment People Progressive Party. Parit called for the commission to fix the issue because it might confuse voters. Nearly 82,000 people have registered to vote overseas, according to the commission. The vote is closing on March 16. Thai expats in Australia are the largest group of overseas voters, with 16,183 registering to vote, reported the Interior Ministry on Wednesday.